Oh, oh, oh, do I have an AWESOME idea to share with you! Last year I bit off a little more than I could chew with a snow globe Valentine idea. While they were very cute, they were pretty time consuming and Big M was NOT interested in the process. 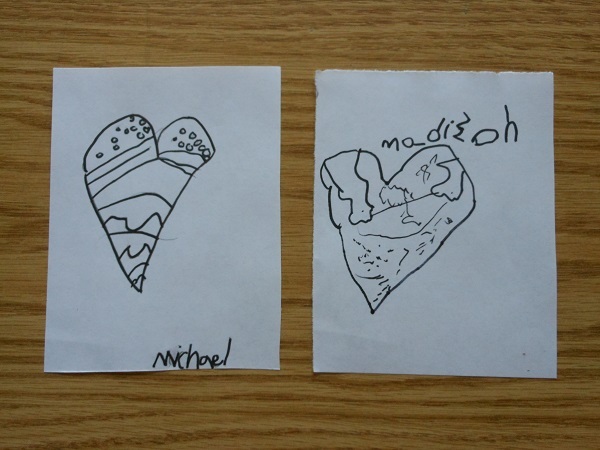 This year my plan was to make cute, easy, kid made valentine cards. SUCCESS! 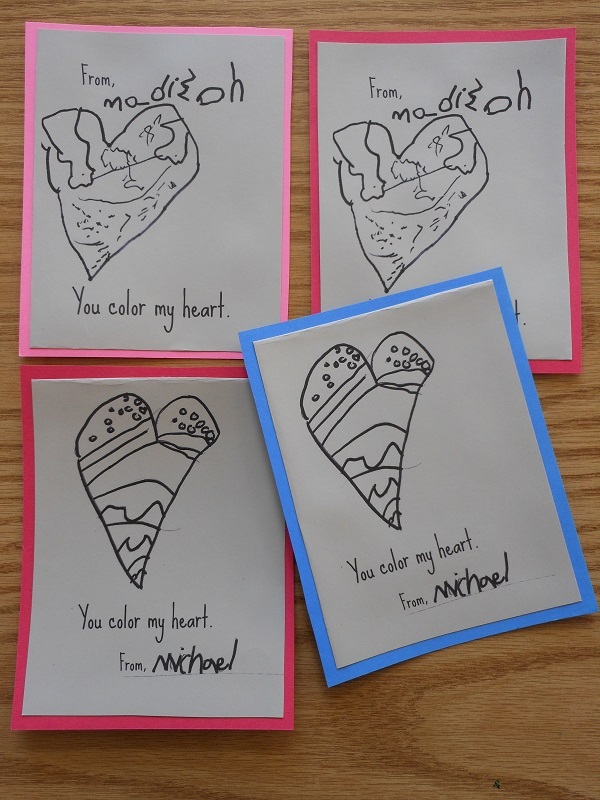 We made “You color my heart” valentine cards and I bet you are going to be making them too! 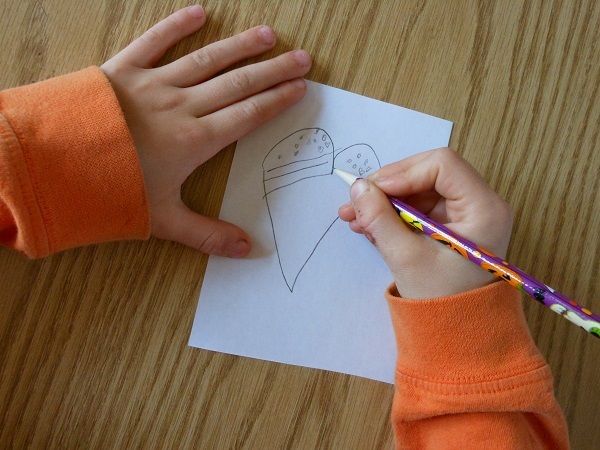 Don’t those make you want to grab a crayon and color?!?! 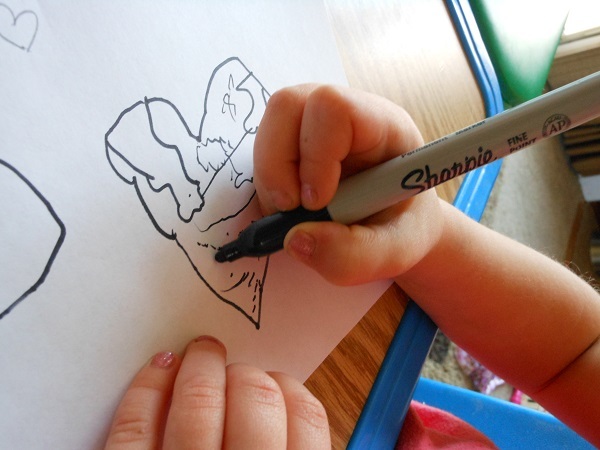 My plan was to draw over their pencil drawn heart with a sharpie. Little M opted to use the sharpie right off the bat. Both ways worked! Once the hearts were drawn I asked them to write their names. I wanted Big M to write the entire thing… he wasn’t interested. Edit the pictures in PicMonkey. 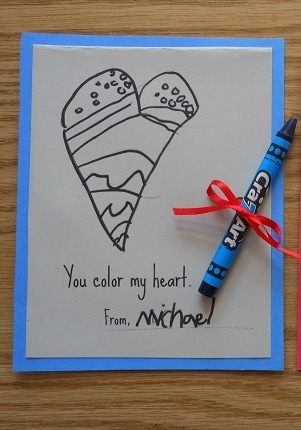 Add the words “You color my heart.” and “From”. Add the edited image to Microsoft Word and re-size them until 4 will fit onto one page. Adjust your printer so that the margins are as small as possible. Once I had the images printed out I cut card stock big enough to work as a border. Then glued the two together. I used a hole punch to punch two holes. 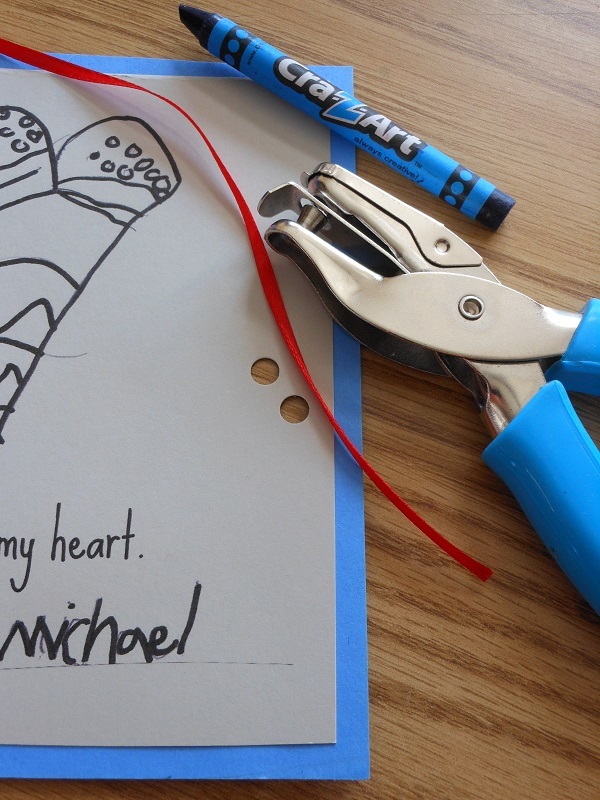 Laced a ribbon through the holes and tied a crayon to the card. That’s it. So easy, fun and CUTE! 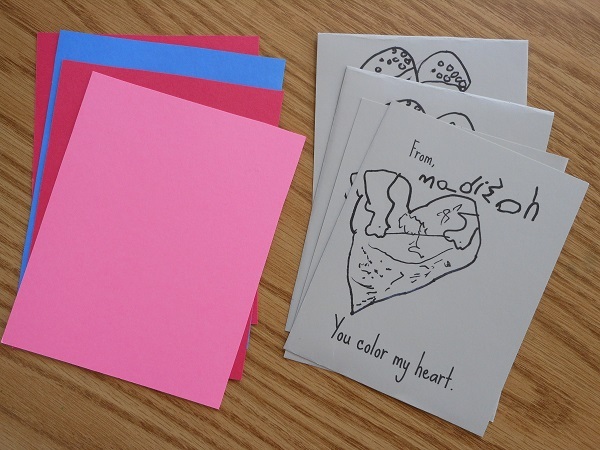 This DIY Valentine Cards post originally appeared on January 12, 2012. I love it! I hope my girls will want to do this as much as I want them to. ME TOO! Please show a pic. The cards could look so different depending on the artists heart! This is such a lovely idea. Will definitely try this with my eldest. Super-cute idea!! I love homemade cards. Thank you! I love homemade cards too! I love this!! So cute, simple and personal. Well done! I’ve just started a brand, new blog — do you think I could write a small blurb about your idea and link it to you? Cute! g at willowday. Thanks for this great idea. I gave my four year old a few choices of what we could do for her valentines and she chose this one. All we have left to do is punch the holes and add the crayons and we’re done. They look great! Thanks again! This is GREAT! 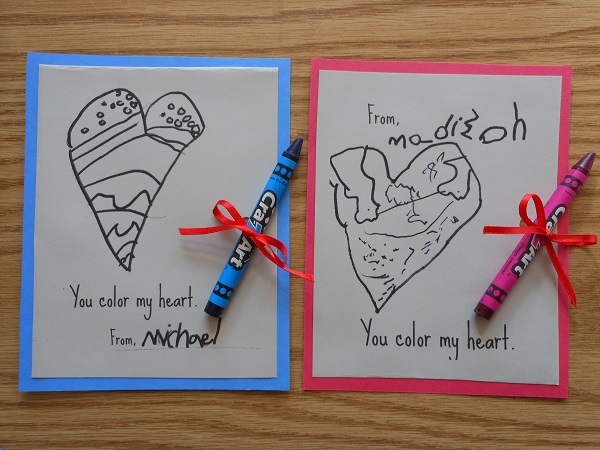 I’ve been looking for a non-candy Valentine for my daughter and I love this idea! She’s working on it right now and I can’t wait to upload it to PicMonkey ~ I never would have thought to use the website to make Valentines. Thanks!